The Tropicbirds are graceful tropical seabirds, cruising the open ocean for fish. Lovely long-tailed adults, like this White-tailed Tropicbird (left), come ashore on remote islands to nest. Younger birds, with decidedly shorter tail streamers like the Red-tailed Tropicbird (below), spend all their time at sea. Because birds in immature plumages are never seen from shore, they remain very little known. Far offshore, however, Red-tailed Tropicbird is the common species in the eastern tropical Pacific. These birds do not yet have red tails; instead the short tail streamers are white (as on this bird) or barely pinkish. This young Red-tailed (right) is in molt. You can see that the two outer primaries are old and retained; the inner primaries have been renewed but the third-from-outer is still growing in and is thus shorter than the outer two. Note that the tips of the new feathers are smooth and rounded while the old outers are more pointed and ragged. We know so little about these pelagic birds that molt sequences are not fully understood. Note also the webbed feet -- these are truly oceanic birds. Tropicbirds nest in small, loose colonies on oceanic islands. 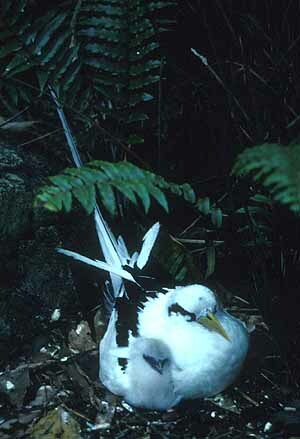 These locales must be either predator free, as is Cousin Island in the Seychelles where this White-tailed Tropicbird (below) has its nest on the forest floor up against the base of a large tree, or they use inaccessible ledges or caves on canyon walls (as on Kauai, Hawaiian Islands). Adult pairs perform spectacular display flights over their breeding islands, and the fuzzy down-covered baby chicks (peeking out from its parent, below) are about as cute as birds can get. There are only three species of tropicbirds. 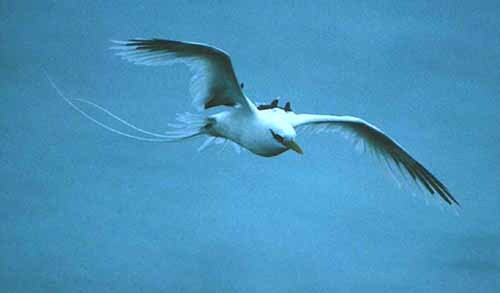 The White-tailed Tropicbird has the widest range as it is found in tropical oceans around the world. There is even a race (P. l. fulva) on Christmas Island in the Indian Ocean whose plumage is tinged golden apricot (colloquially called the "Golden Bosunbird"). Despite the wide range, however, this species tends to stay closer to shore while the Red-tailed Tropicbird is a pelagic specialist, occurring hundreds of miles offshore. Red-tailed is very widespread in the Pacific & Indian Oceans, but it is absent from the Atlantic. The third species is the Red-billed Tropicbird (two photos below). Like the White-tailed, it tends to be an inshore species. Its range is restricted to the western Pacific (esp. west Mexico & the Galapagos), the tropical Atlantic, and the Red Sea area of the northwestern Indian Ocean. 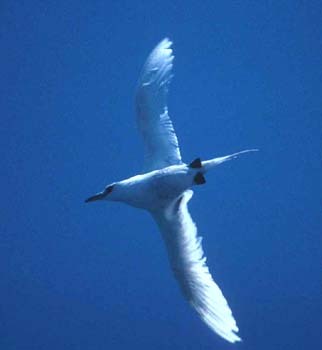 All tropicbirds specialize of tropical fish, and for all flying fish are often the most important parts of their diet. All have black feathering just in front of the eye which presumably makes it easier to observe flying fish against the glare of the open ocean. Red-tailed -- with bigger bills -- take even the larger flyingfish such as those in the genus Cypselurus. All species will eat squid or crustaceans when available. It is always striking to see a long-tailed adult tropicbird sitting on the sparkling blue ocean -- with its tail raised to form a graceful arch -- as is the Red-billed below (top photo). Occasionally a tropicbird will "crash" into a ship, as did the Red-billed (bottom photo) that I photographed aboard the McArthur during four months at sea in 1989 on a NOAA tuna-purpose research cruise. It may have been disoriented by our lights at night which attracted both the tropicbird and lots of squid. We released it unharmed. All three tropicbirds are closely related within the single genus Phaethon; there is a fossil from England aged at 50 million years ago that corresponds to a fourth (now extinct) species (Orta 1992). Photos: Both the in-flight and nesting White-tailed Tropicbird P. lepturus photos were taken on Cousin I., Seychelles, in Nov 1992. The young Red-tailed Tropicbird P. rubricauda was taken in the eastern tropical Pacific at about 14°N, 145°30'W. The Red-billed Tropicbird P. aethereus sitting on the ocean was just off San Clemente I., s. California, on 12 Sep 1982; the adult Red-billed came aboard the McArthur just south of the Galapagos Is. on 26 Sep 1989. All photos © D. Roberson; all rights reserved. There is no "family book" per se of which I'm aware (there are numerous coffee-table "survey" books that include tropicbirds among other sea-birds), but an excellent introduction to the family, with striking photos, is in Orta (1992). That survey, however, has overlooked the eastern tropical Pacific distribution of Red-tailed Tropicbird (correctly shown in Pitman 1986). Because it is so pelagic, Red-tailed appears to be the least known but a good summary of what was known at that time is in Gould et al. (1974). Gould, P. J., W. B. King, and G. A. Sanger. 1974. 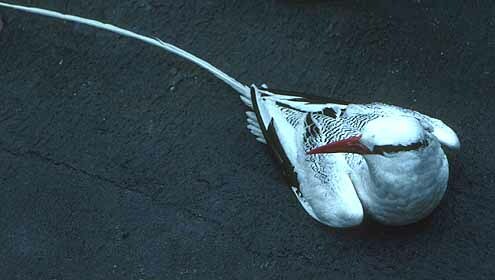 "Red-tailed Tropicbird" in Pelagic Studies of Seabirds in the Central and Eastern Pacific Ocean. Smithsonian Contrib. Zool. 158. Orta, J. 1992. Family Phaethontidae (Tropicbirds) in del Hoyo, J., Elliott, A., & Sargatal, J., eds. Handbook of the Birds of the World. Vol. 1. Lynx Edicions, Barcelona. Pitman, R. L. 1986. Atlas of Seabird Distribution and Relative Abundance in the Eastern Tropical Pacific. NOAA, Nat. Mar. Fish. Serv., Southwest Fisheries Center admin. rpt. LJ-86-02C.